I thrive off positivity. I am optimistic and enjoy being around other positive people. Negativity really irks me and makes me feel weird….and honestly I have a tough time being around negative people because I don’t like the way I feel, think, or act when I’m around them. And unfortunately, it’s so easy to get caught up in that type of thinking, gossiping, pessimism, etc. I have caught myself trying to avoid talking about the positive things in my life around certain people for fear they will think I’m bragging or annoying or fake; that I’m trying to live a “perfect life." I give in to them and participate in their negativity, and always regret it later. In reality, it’s taking away the glory from God for all that He has blessed us with…and that is not okay with me. Why is it SO MUCH easier for someone to bring us down than for us to bring them up?? I think it’s because human nature is sinful, so it’s EASY to fall in to that trap…and Satan is always tempting us and trying to attack our thoughts, minds, & hearts. When I taught a youth SS class, I always taught the girls to think of it like being on the side of a swimming pool- one person down in the water and the other standing on the side. It is so much easier for someone to pull you down into the water than for you to pull them out of it. And the same is true in life. That’s why we have to guard our hearts. Some people are naturally more positive or negative than others, so it takes intentional effort sometimes to see the positive in situations, circumstances, and others. I strive to be positive and surround myself with other positive people. And it is absolutely worth the effort. I recently read this article about how negative energy affects your life & it was so insightful. It’s definitely worth taking 5 minutes to read. I think sometimes people assume I’m a “happy idiot” or putting on a fake front, but I assure you, being positive is very intentional for me. I CHOOSE this. I CHOOSE joy. I loved this excerpt from the article backing that concept. Here’s the deal with negativity. As a Christ follower, we are not called to that type of talk, thinking, attitude, etc. Even if you’re not a believer, your life can surely benefit from getting rid of the negativity. But believers are called to this. If this is something you struggle with, pray for the Lord to change your heart. To help you see the positive in yourself, situations/circumstances, & others. To help you have a grateful heart. To focus on your blessings. To claim the victory in Christ that has been promised to us. A thankful heart can change your whole perspective. And so many times we make excuses for WHY we can’t be positive. Others haven’t walked our walk. They haven’t experienced our trials, our difficulties, & our struggles. But the truth is, GOD knows. HE feels it. And He is just WAITING on us to give it to Him, trust in HIM, and focus on the good. A good friend of mine always says this, and I am convinced of the truth behind it. 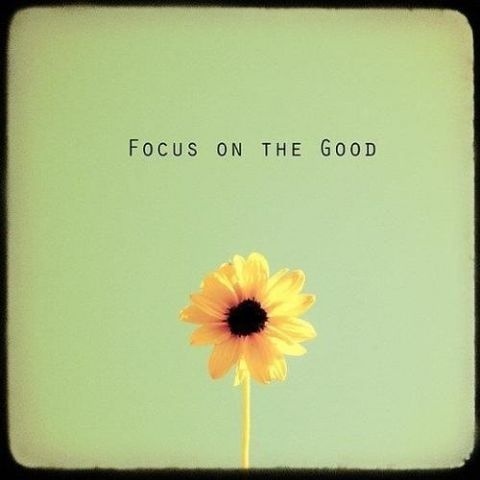 “What we focus on increases.” It is important to be mindful of what we are focusing on in our lives. So… what are you allowing into your life, your family, and your home by what you think?? What changes can you make to live a more positive life?? This post really hit home for me. People always ask me why I am so positive about things. This is the way that I like to live my life. Thank you for this post and giving me even more reasons to be this way. AMEN! I needed this :) It is so easy and such a trap! Thank you for this. God has been speaking to me in many ways about this same subject lately. I have been falling in to the trap of complaining when I should be positive and choosing joy. I needed this tonight! Thank you so much for sharing this post! It is obvious that the Lord has his hands on you and I appreciate you taking time to share your experience and perspective! I sat and thought - I wish she were closer because I would love to be around someone with that type of spirit. Thanks for sharing your knowledge and reminding us that we can choose to be different. Thank you for letting the Lord use you as a vessel! These words were so precious to me ... I have been struggling at work with the negative comments around me. They even ask why I need to be so positive and that they will get me "down to their level" sooner or later. Thank you for this and for being a shining light! I need this post today. I never realized how much negativity I was around until recently. It really does but a damper on your spirit. Thanks for your uplifting posts! Always great to get "real" encouragement! Absolutely loved this! Felt like I was reading about myself and it really helps so when someone says I'm not living realistically I know what to say!